online reputation. Perhaps it’s time to address and clean up areas in all aspects of your life. Myfico.com can help repair a poor credit score though just like how Reputation.com can restore a negative online image. First, find out your credit score. You may be in financial trouble without even realizing. The following will help you learn more about credit ratings and what you can do to maximize your financial health. FICO scores fall between 300 and 850, and a higher number is a better score. Your credit number is important because it affects your ability to get a loan or other form of credit. Lenders look at borrowers and decide how much of a risk borrowers pose. The higher your credit score is, the lower your risk is to the lender, and thus chances of getting the loan increases. Other factors must show that you have the ability to repay too. Use free services like Credit Sesame to learn your current credit score. 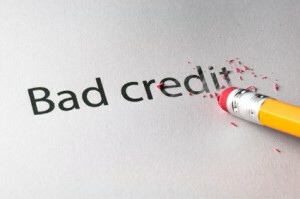 A FICO score of 620 or lower is considered bad credit, according to Bad Credit Offers.com. The “bad credit” cut-off point will vary from one lender to the next. A bad credit score occurs either because you have little credit history from which to create a credit rating or your credit history has a negative factor that lowers your card. A bad credit score can cost you significant amounts of money. If you find a loan despite your bad credit, expect to pay more in interest rates, warns Experience.com. As a high-risk borrower, you may also experience difficulty in purchasing affordable housing. Landlords evaluate credit scores during an overall risk assessment while approving your application. You may even find that your car insurance premiums go up and employers are less willing to hire you — all because of your poor credit. Get a copy of your credit report and ensure it is accurate. Start paying bills on time. Know how credit scores are figured. Learn the actions to take to correct errors. Research credit-repair services, which are often scams. Pay down credit cards to less than 30 percent of the credit limit. Use cards minimally or in an emergency. Check credit limits for accuracy. Ask credit card companies for “goodwill adjustments” on an occasional late payment. Dispute old negative reports, as most collection agencies will not verify that the account was yours if it is old enough. Your credit rating is a valuable tool in your financial stability and flexibility. A low credit score does more than just make it harder to get a loan. It can cost you monumentally, so learn what your score is, and then take the time to heal a bad one. Megan Ericson is a real estate agent and financial consultant for local SMBs, Megan shares insights on how to organize your finances.